During varsity English, one of our set works was The Portrait of the Artist as a Young Man by the Irish authour James Joyce. Unlike so many other students (including those who – unlike me – were majoring in English) I actually read the book, and I’m glad I did. Having been thoroughly absorbed by Joyce’s famed stream of consciousness novel, I didn’t have to think twice about picking up his compilation of short stories, The Dubliners, for the Irish leg of my reading challenge. It instantly brought to mind the line from Neil Young’s song, My My Hey Hey, “it’s better to burn out than to fade away”. Kurt Cobain quoted this lyric in his suicide note, in 1994. I wonder if he, or Young, knew of the mutual reflections that swirled through Joyce’s mind, which he penned in his short story, ironically titled The Dead. Joyce would have to compete for the spot as my favourite Irish writer with Oscar Wilde. But they don’t really compare. Both delivered shrewd social commentary through their writing, but in distinct ways that make both of them memorable to this day. My first Wilde encounter was with The Importance of Being Earnest; also part of my set works for varsity English; but it was only somewhat later that I fell in love with Wilde’s deliciously sharp wit. I’ve already devoured about half his work – having acquired his complete works – and luckily there is still plenty for me to enjoy. George Bernard Shaw is another great. In high school we studied Pygmalion, upon which the musical My Fair Lady is based, and at varsity we contemplated Saint Joan and Major Barbara. I have always loved My Fair Lady – despite its dubious ending – and delighted in reading the part of Eliza Doolittle, in class. That was hardly the end of my Irish literary instruction. I also read Gulliver’s Travels by Johnathan Swift in varsity. And, having studied drama, watched endless extracts from Samuel Beckett’s Waiting for Godot. We also have the Irish to thank for the familiarity of Dracula. It was the Irishman Bram Stoker who immortalised the legend we now know so well and have watched in countless movie and TV adaptations. 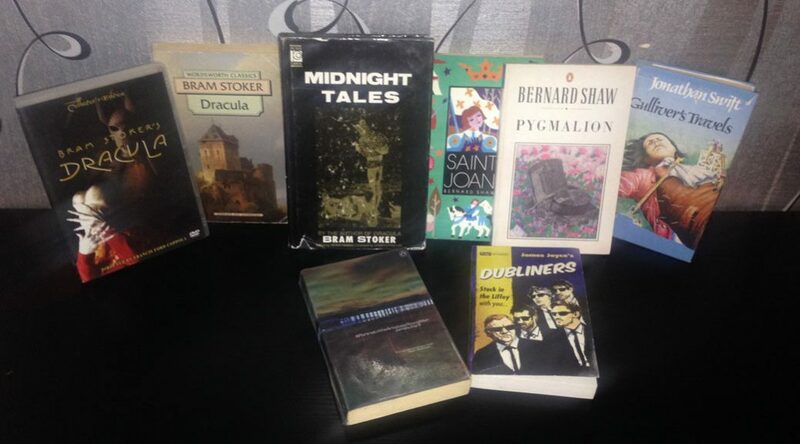 With this wealth of literary treasures, I can just imagine the wonder of embarking on a literary tour of Ireland, uncovering the sights, sounds, and spaces that inspired the wit of Wilde, the macabreness of Stoker, and the streaming jumble of Joyce’s thoughts. What Oscar Wilde books would you recommend reading? Been wanting to start reading his books from a Christian perspective but I have no idea where to start or go from there. Any advice? His play The Importance of Being Earnest is a good start. It’s very witty and has great characters.